Unique hair accessories are a serious trend in bridal fashions. 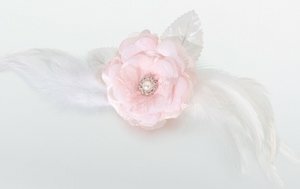 This pink feather and tulle hair clip is right on trend. Measuring 9" across, this interesting clip can also be used as a pin. A lacy pink flower anchors the arrangement and delicate feathers create width. The flower is accented by a pearl bead ringed with rhinestones. It's also available in white.